The Bangkok International Motor Show is open from now until April 6. This is the only internationally accredited motor show in Thailand, and is at the BITEC venue again. BITEC is at Km 1 on the Bangna-Trat Road. The show covers both cars and motorcycles, and I will have motorcycling expert Alan Coates with me to cover two wheels while I cover four. There are also displays of classic cars and some of the car clubs will also have stands at the show. Last week I asked what engine was described as having “pistons like dustbins, moving deliberately up and down like lifts by Nogood-Waytis”? This was in reference to the enormous displacement engines of around 1910-20. This particular one was the 21 liter four cylinder Maybach. So to this week. What is the connection between the famous aviator Louis Bleriot and automobiles? The Team ManTTx Racing Electric Bike team is ready to build on first year achievements, and have confirmed that they will be competing in the 2010 TT Zero clean emissions race, which is part of the 2010 Isle of Man TT Races. 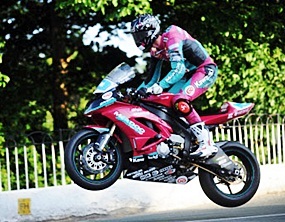 The Manx team competed in 2009 and recorded a lap time of 70.677 mph average speed around the thirty-seven and three quarter mile Mountain Course and were class leaders and second overall in the first qualifying session. Unfortunately rider Dan Kneen was subsequently injured and was replaced by experienced campaigner James McBride. The team’s machine has incorporated a Ducati spaceframe chassis. It has dual motors with a keyed output shaft. The powertrain is a one to one belt with a primary drive and wire-eroded pulleys. The battery system has 2x40 Amp/Hr and 2x31 Amp/Hr packs. The team are currently engaged in drivability testing at their workshop at Ramsey shipyard and have been running dynamometer trials. This weekend they tested at Jurby Circuit and were not only very satisfied with the bikes performance and handling but gathered much information for ongoing improvements. During the 2009 race the team was going well to Sulby but then one of the motor brushes broke and damaged the remainder on the right hand side motor. The resulting short circuits overheated the motor and resulted in the bike’s retirement. However the team are confident that they have fixed the problem and are looking forward to competing again in 2010. Qualifying runs from Monday, May 31st, to Friday, June 4th, 2010. Lexus is heading back to the legendary Nrburgring this spring to challenge for glory in the 24 Hours endurance race with its LFA supercar. It will be the first time the production LFA is seen in full-blooded competition, taking on one of the world’s most challenging circuits in a marathon test of speed, handling and durability. In two previous outings in the event, development versions of the LFA were raced primarily to help hone performance and handling. This time the LFA will line up as a prime challenger in standard production car guise. It’s a formidable proposition: with its advanced, lightweight composite construction and 552 bhp mid-mounted V10 engine, it will reach 100 kph in just 3.7 seconds and race on to a top speed beyond320 kph. 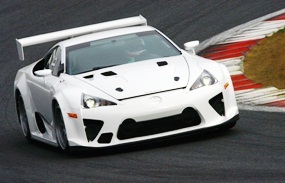 Gazoo Racing will prepare and field the two LFAs in the event, which takes place from 13 to 16 May. Led by Toyota master test driver Hiromu Naruse, the team will include four Japanese and three German drivers who between them boast outstanding GT and endurance racing experience. Last week I spent 24 hours with the new Mazda2 sedan, or as Mazda likes to call it, the sports sedan version of the hatchback. It was an amazing little car, very responsive on the road with adequate room for front and rear seat passengers, even when the driver’s chair was racked back to the end of its adjustment. For a small passenger car, it was ‘almost’ excellent. For a Sports Sedan it was also ‘almost’ excellent, to the point where I began to wonder just where Mazda thought this car should lie in their line-up. It shares much in the body with the five door hatch, but with a boot tacked on in the rear. The somewhat funky looks were able to absorb the extra boot area without it appearing as an ‘add-on’ and this gives a usable 450 liters of boot space. The rear seats are also split 60:40, so longer items can also be carried. The driver’s seat was adequate for most, but with the description of ‘sports sedan’ I would have preferred more lateral support. The gauges were set out simply, and with large circular dials, were easy to read. The controls, for the most part, are simply rotary dials which are so much more user friendly than drop down menus and repetitively stabbing a touch screen. Driving around Thailand’s goat tracks, otherwise known as ‘roads’ the firmness of the suspension becomes very noticeable, to the point of being intrusive at times. The suspension and chassis dynamics were best explored off the public roads and I took the car to the Bira circuit to explore its limits. And the limits are very high. The Mazda2 sedan sticks to the track like it was painted on it. This car is excellent as far as road holding is concerned. It would be difficult for the average motorist to find him or herself in a situation where the car would not be able to stay on the blacktop. Suspension-wise, this Mazda2 really is a sports sedan. However, remember that physical laws still have to be obeyed, no matter how good the apparent road holding. It was on the Bira circuit that a deficiency as far as being a sports sedan was very evident. The 1500 cc engine develops 103 bhp at 6,000 rpm and 135 Nm of torque at 4,000 rpm and this was not enough. To be able to utilize the chassis, the engine needs at least another 20 bhp, and this would need a 1600 cc engine, to which Mazda has access through its global networks. 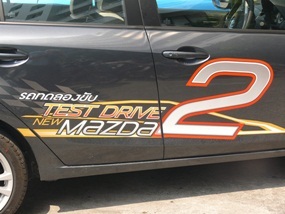 So here lies the schizophrenic nature of the Mazda2 sedan. It has the interior space and very sharp turning circle of a family sedan. It takes 91 octane fuel, or E10 or even E20, and it has the gentle nature of a family chariot. Yet it has a chassis which delivers totally dedicated sports sedan performance. The question which was still unanswered when I handed it back was just should the spring rates be softened to make it a more comfortable family car, or should the engine be uprated to make it into a performance sports sedan? The five door hatches come in some wonderful colors, like a wild iridescent green for example. 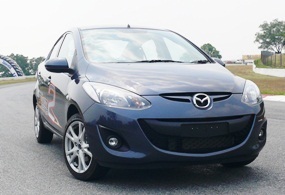 The Mazda2 Sports Sedan as tested came in a drab grey, hardly sporty at all. We should not forget the price. Entry level (and manual transmission) is THB 535,000, going up to THB 675,000 (higher spec cars all auto gearboxes). That puts it right amongst the Honda Civic / Toyota Vios grouping. 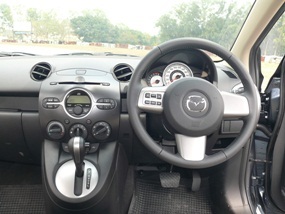 If you are contemplating either of these cars, you should also consider the Mazda2 sedan.